On the heels of “Southie Rules,” and in anticipation of VH1’s March series “Wicked Single,” which is bound to be singularly wicked awful, TNT’s “Boston’s Finest” is a welcome sight. Rather than treating its local subjects with contempt and milking their Boston accents for what is now the most worn-out joke in the country next to the Harlem Shake, the new reality show has only respect for its cast. As the title indicates, this chronicle of a collection of Boston police officers, ranging from gang and fugitive unit officers to beat cops, is meant as a sincere shout-out to law enforcement. “These cops think the darkest corners of their city are worth saving and that they were the ones born to do it,” executive producer Donnie Wahlberg says in the premiere, Wednesday night at 9. That’s good news, and so is the fact that “Boston’s Finest” is refreshingly free of reality TV’s more insipid and manipulative dramatic tricks. Like the “Boston Med” and “NY Med” series, the show wants to impress us with serious-documentary trappings. Each episode runs an hour, so the editing isn’t frenetic and forced, and Wahlberg’s calm narration has none of the staginess we’ve come to expect from the genre. The camerawork, too, is straightforward and gimmick-free. There were only one or two moments in the first two episodes that seemed in any way set up by the filmmakers, most notably a dinner date between patrol partners Jenn Penton and Pat Rogers. Thankfully, none of the cops seemed doomed to be presented by the producers as reality TV’s clichéd Villain. The episodes move through the kinds of ordinary moments a lot of scripted police dramas leave out. We see some real partner banter, not only between Officers Penton and Rogers, who do appear to flirt a bit, but also between Officers Diamantino “D” Araujo and Manny Canuto over hair styling. We get to feel what the Fugitive Unit knows too well, that apprehending fugitives requires lots of patient waiting and common sense — as in, maybe the wanted man is visiting his girlfriend, so tail the girlfriend and cross your fingers. In one scene, Officer Greg Dankers moves on a bad guy he has been looking for and, when the guy lies about his name and age, Dankers identifies him with the help of a photo of his tattoos. It’s a rewarding twist. 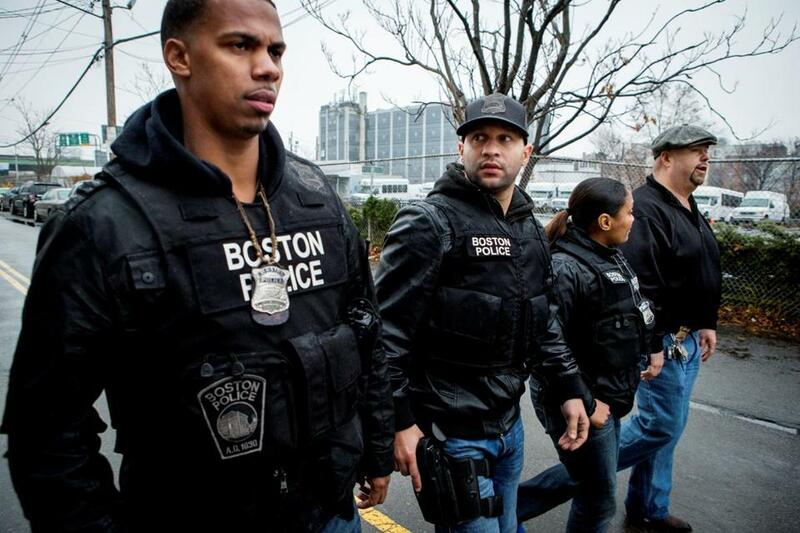 The less good news is that “Boston’s Finest” may be too aimless and pointless to inspire loyal viewing. It can be a little dull over the long haul, perhaps because the action we see isn’t particularly interesting and the family lives of the cops are relatively incident-free. The filmmakers, including Wahlberg’s co-executive producers Seth Jarrett and Julie Insogna-Jarrett, were not fortunate enough — strictly from a narrative point of view — to stumble across more tension-filled moments during the making of the first two episodes. And there don’t seem to be any internal-affairs issues looming. Reverence is nice, but not necessarily of weekly interest — except, perhaps, to the Boston Police Department’s PR office. The appeal of watching cops stop suspicious drivers or take their own kids to school is limited, making the idea of carefully scripted police dramas such as “Southland,” next week’s “Golden Boy,” and even Wahlberg’s “Blue Bloods” more appealing. The one subplot in “Boston’s Finest” that resonates most of all belongs to Officer Penton, who has a personal reason for her interest in drug arrests. Her twin sister, who has a long history of substance abuse, has given up a son for adoption. Penton visits the child and then meets with her sister over lunch in what is a striking image of two women having taken radically different paths. We get a clear and touching sense of how Penton’s family situation fuels her professional life, and how inspiration and greatness can be born of pain.